$1,499 per person – Take advantage of our special promo pricing until June 30! Upon completion of this course, students will learn the duties and responsibilities of the confined space entry participants and be capable of identifying and adapting to the hazards of confined spaces. Students will be able to identify and define safety standards for safeguarding confined space entries and train this course internally within their workplaces. Complimented with written and practical skill assessments throughout the course to ensure thorough understanding of principles and practices, the 16 hr Confined Space Train the Trainer course will allow the entrant, attendant, or supervisor to safely and confidently understand and evaluate the hazards and procedures associated with confined spaces. This training will help you to differentiate between a Permit-Required confined space and a Non-Permit-Required confined space. 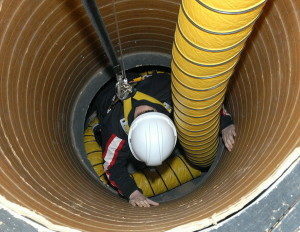 The course will address the hazards associated with confined spaces and it will outline the duties and responsibilities of all members of a confined space entry team, emergency rescue procedures, and plan development. In addition to confined space entry procedures and hazards, this course will discuss the need for appropriate personal protective equipment and the selection characteristics and pre-entrance testing for each level of protection. Documentation will be provided to the student to satisfy due diligence and local regulation compliance. Although SSM qualifies and/or certifies students for the skills and abilities required according to Provincial / Federal / CSA requirements, it is up to the employer to provide on-going assessments and/or supervision to qualify their employee as a “competent” person.